During the most recent 12 month period for which data are available, a total of 29 detainees were transferred by Immigration and Customs Enforcement (ICE) from the Southwest Key - Conroe where they had been temporarily housed to other facilities. The average stay for these individuals before their transfer was 74 days. This is a special facility for housing juveniles. Use of this facility was handled by the Office of Refugee Resettlement (ORR), Division of Unaccompanied Children's Services, U.S. Department of Health and Human Services. Transfers made up 8 percent of the 383 detainees who in one way or another left this facility during the last 12 months. This report focuses just on these transfers. The remaining individuals who departed from the Southwest Key - Conroe last year actually left ICE detention. These individuals were deported from the country, released under supervision while their cases was being decided, or left ICE detention for a variety of other reasons. For more information on this facility please see additional TRAC reports in this series. Detainee transfer rankings. The Southwest Key - Conroe was one of 637 facilities nationwide that housed ICE detainees during the most recent 12 month period. Of these 637, there were 409 facilities that had at least 10 ICE detainee transfers last year. Excluding those facilities with fewer than 10 transfers, the Southwest Key - Conroe last year ranked in the top 78 percent nationwide in the number of individuals it transferred to other ICE facilities. This means that 78 percent of the locations contributed the same or a larger numbers of transfers, while 22 percent had a smaller number. See Table 1. Average length of stay before transfer. Once detainees arrived at the Southwest Key - Conroe their average length of stay before being transferred on to another ICE facility was 74 days last year. Ranking facilities from longest to shortest detention stays for their transfer population, this average of 74 days placed Southwest Key - Conroe in the top 7 percent of all facilities nationwide. That is, for detainees who are transferred, 7 percent of ICE detention facilities have the same or longer average stays last year, while 93 percent of detention facilities had shorter average stays. Were these detainees arrested locally? Where did those that ended up being transferred from the Southwest Key - Conroe last year originate? Information on the place of arrest was not included in the available data ICE released. However, we can examine whether the Southwest Key - Conroe was the first ICE facility in which these detainees were held. According to ICE records, for some (21 percent) of these detainees, the Southwest Key - Conroe was the first place they were sent when they were detained by ICE. The remaining 79 percent had been transferred in from another ICE detention facility. We can also look at how quickly they arrived at this facility after they were first detained. A total of 86 percent arrived at the Southwest Key - Conroe at some point during the very first day they were detained by ICE. This percentage is also based on an analysis of the most recent 12 months for which data are available. How soon did transfers occur? Nationally, the median number of days before an ICE detainee is transferred to another facility was 1 days last year. That means that half of all transfers occurred on or before the 1st day, while half had longer stays before they were transferred on to another ICE facility. Note that nationally the average stay at an ICE detention facility before an individual is transferred is longer - 12 days. This is because while most detainees have relatively short stays before ICE transfers them elsewhere, sometimes stays are lengthy and these lengthy stays raise the average to above the median stay. For the Southwest Key - Conroe last year, the median stay before a detainee was transferred was 81 days. This is much longer than the national figure. The average stay before transfers occurred was shorter - 74 days - than the median stay. As noted above, this figure placed the facility in the top 7 percent among ICE detention facilities nationwide in the average number of days a detainee spent before he or she was transferred. Where did those transferred get sent? ICE currently has great discretion about where in the United States transferred detainees are sent. For the period covered by these data, ICE divided the country into geographic regions or areas and assigned each to one of 152 document control offices or DCOs for the purpose of keeping track of detainees. Available data allow us to examine whether the transfer occurred within the same DCO or the transfer was to a different DCO. For the nation as a whole during the latest 12 months, 54 percent were within the same DCO, while the remaining 46 percent were to a different DCO. Figure 2 and accompanying Table 3 provide some comparative figures for how the Southwest Key - Conroe stacks up against this national pattern. Last year, 62 percent of the transfers from the Southwest Key - Conroe were to locations in the same region -- facilities under the control of same ICE docket control office. 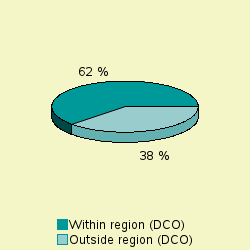 A substantial proportion (38 percent) of the transfers went to detention facilities in a different region (DCO). Which nationalities predominate? Last year in the United States, individuals from Mexico comprised the largest number of those transferred by ICE. Some 41.3 percent of all transfers recorded Mexico as their country of origin. The Southwest Key - Conroe had a much smaller proportion of detainees from Mexico - 10 percent - among their transfers. Detainees from Mexico were not the largest single nationality group among the transfers at the facility. In descending order, the top nationalities that made up transfers from the Southwest Key - Conroe last year were: Honduras (45%) , Guatemala (41%), Mexico (10%) and El Salvador (3%). Out-of-region transfers by nationality. Within the nationalities that made up those listed in Table 4, the proportion transferred out of the region varied from 0 percent to 54 percent. As mentioned above, on average 38 percent of detainees transferred from the Southwest Key - Conroe were sent to detention locations outside the region. For Honduras with a total of 13 transfers, 54 percent of transfers were out-of-region transfers. More than one country was tied with the lowest out-of-region transfer rates (see Table 4).